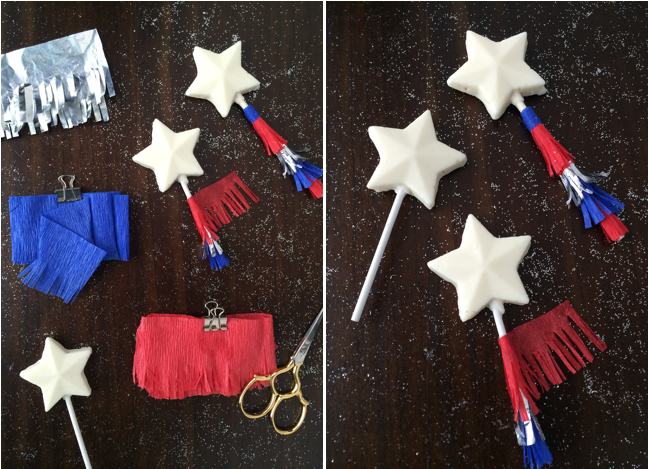 My mother, my husband, a slew of other relatives, and I all have birthdays on or around Independence Day, so I'm always searching for fun ways to dress up traditional star spangled treats. This project seemed like the perfect excuse to whip out my faceted star lollipop mold, but if you're too time strapped or just not into making candy, feel free to buy inexpensive star lollipops for a simple project. It's so easy that my five year old helped me assemble these Fourth of July lollipops. I'll admit, I'm jazzed that she inherited my crafty genes. 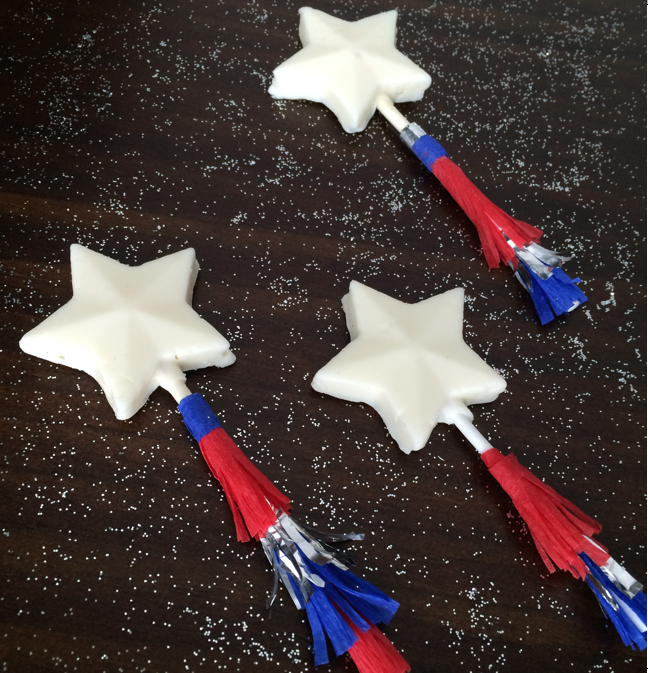 A multi-colored splash of fringe turns ordinary star lollipops into edible little fireworks. Kids and kids at heart will love these little sparklers. Step 1: (Note: If you are using store-bought star lollipops, skip this step.) Melt and prepare your meltable white chocolate according to package directions. Slowly pour chocolate into star lollipop mold. Tap the filled mold on a flat surface to release air bubbles and help the chocolate settle into the nooks and crannies of the mold. Insert the lollipop stick, and set aside to cool. Step 2: Using your scissors, cut thin widths of fringe into strips of crepe paper streamers. Wrap a thin strip of double-sided tape around the lollipop stick, about 1/2" from the stick's end. Carefully wrap your first layer of fringe around the tape to secure it to the stick. Repeat layering on different streamer colors. Space each new layer about 1/4" higher than the one before so that each color is visible on the stick. Step 3: To create a finished look, wrap and tape a thin band of crepe paper at the top of the last/outermost layer of fringe. 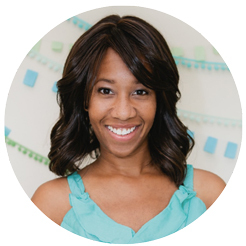 Photos by Shauna Younge of Sweet Tooth for Momtastic.